We were there to spend time with family from Virginia, New Jersey and Pennsylvania and were there for 7 days. The campground was quiet during the week which was very nice. The campground staff were friendly and helpful. We camped at Mountain Vista Campground in a Fifth Wheel. This is my second season at Mt Vista. I came in May this year and left in October. I love this park. Staff is super friendly and helpful. Even on busiest weekends the nights are quiet. My site was big enough and had bushes on either side so my views were of trees not another camper. Wi-Fi always good.Water pressure excellent. 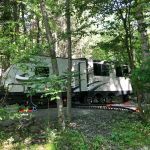 We camped at Mountain Vista Campground in a Fifth Wheel. Sites were clean and well landscaped. Has a nice unbothered earth look. Bring cash they don't take card. There is an ATM on site for a fee though. We camped at Mountain Vista Campground in a Fifth Wheel. This is an absolutely beautiful location but I would not stay here again. The drive into the park and the registration parking was on a very dangerous hill, not good if you don't have very good brakes. The site was again in a beautiful location but it was very unlevel. I have an automatic leveling system and it would not level the RV. I had to use it in the manual mode and still didn't get it right but acceptable for one night. The price, given the time of the year, was ridiculous. The hookups were not well placed, I had to move way forward to even think about hooking up to electricity. The water pressure was so low, I think if I had used a pressure regulator, it would have helped not hindered. I would have hated to have been here in the height of their season; there would have been no water. The road around the sites was very tight, if someone with little to no experience with tight places would have ruined their RV. The site was dirt with a little stone thrown in for the tourists. We camped at Mountain Vista Campground in a Fifth Wheel. Shaded park with tight spaces. Lots of trees which makes maneuvering through campground tricky. Like most northern campground we've been to, it's pack em and stack em. The better sites have long stay campers. Sites are not level. Could be a nicer park if they got rid of every other site. We camped at Mountain Vista Campground in a Fifth Wheel. This is a mountain campground with Level sites terraced in the mountain side. The sites are pea gravel under the rig with some grass and pea gravel on the remainder of the site. Road ways are gravel. There is plenty of natural vegetation between sites to offer some privacy without being jungle like. Lovely pool and plenty of activities for kids but quiet enough for adults. The owners are super nice and helpful. The only negative I found was the laundry room which was dusty and full of dead bugs. I took my own cleaning towels to wipe it down and all was OK after that. We camped at Mountain Vista Campground in a Fifth Wheel. This park was way too hilly for me and dog walking. 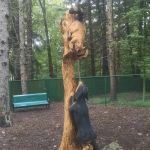 I missed the opening of a new dog park by a week. Pool was cold so never went for a swim. Cable okay and good Wi-Fi, but not impressed with the park in general, nor the area. We camped at Mountain Vista Campground in a Fifth Wheel. All sites are shaded and have division between your next campsite. Our site was a little on the small side for our 30' 5th wheel w/ 1 slide. We could barely fit our truck on the site with us. We did see other sites that are larger, which we would ask for if we came again. Used the restrooms by the office, they were not clean at all. Tried the other restroom on the hill, they were better. We didn't use the showers at all. A lot of amenities. They had a band one of the nights we stayed and it was very enjoyable. Everyone was very friendly, the staff and other campers. Very close to a lot of things to do in the Pocono Mountains. Would stay again. They will get a 10 next time if they have clean bathroom facilities and a larger site to accommodate us. Would recommend to a friend. We camped at Mountain Vista Campground in a Fifth Wheel. We were very pleased with this campground. The owners were very pleasant to talk to, and they were very accommodating. They are truly a dog friendly campground. We have two german shepards. One is extremely large and intimidating to look at, but he is very well behaved. The owners took the time to get to know him and fell in love with him. The campground also sells discount tickets to Bushkill Falls, which is dog friendly too. The sites are very nice. We were in site E3 which was a tight fit for our 34' 5th wheel, but it did work. We would definitely camp here again. We camped at Mountain Vista Campground in a Fifth Wheel. The campground is okay and I had no problems or issues to contend with. The sites are not large nor are they small, about average size. There is no laundry facility, but one is in the works. The bathrooms were pretty nasty with standing water on the floor. There were no urinals in the mens room, but perhaps there is a plan to replace? Access to and from the campground is excellent. There is access for all size rigs, but I will say it is tight due to the number of trees. A spotter is a must. The wireless internet worked great! We camped at Mountain Vista Campground in a Fifth Wheel. We have a 38' Fifth Wheel with 3 slide outs. We told the campground this info when making our reservations and requested a pull through site but none were available. They put us in what they promised was a large easy back-in site. We arrived after dark in the rain. This campground is beautifully treed and very hilly with large boulders scattered about. To get to our site we had to go up to the top of a hill, make a severe 180 degree turn, all the while trying to miss the trees and boulders in order to make our way onto the road where our site was. On the way down the steep hill, we discovered our site. 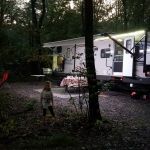 Boulders, trees, other RVs made it impossible to back into our site - in the dark in the rain. Keep in mind we had to back up UP HILL - pushing 15,000 lbs of trailer - to try to get into this site. Our truck started to spit transmission fluid to the point our transmission failed. NIGHTMARE! If you have a large trailer or 5th - get a pull through at this campground! We camped at Mountain Vista Campground in a Fifth Wheel. Not our best choice for a campground. The desk staff was quite indifferent when we asked questions. We checked in in the middle of a downpour, late (about 8:00 pm) and asked if anyone could show us to our campsite (we were never there before & the signage is very poor). The did offer to help us, but the drove their cart to the front of the site and said, "here it is" and left. Did not offer to help back in to a very narrow site, on a hill, located on a corner of the camp road. Fortunately, neighboring campers came to our rescue. Nothing much to do there. We decided there were nicer places to stay. Certainly where the staff is much more hospitable. We unfortunately will not return. We camped at Mountain Vista Campground in a Fifth Wheel. Excellent park. Highly reccomened and we will be back soon. Plenty of things to do in the area. 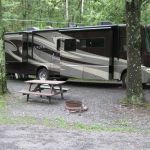 We camped at Mountain Vista Campground in a Fifth Wheel.